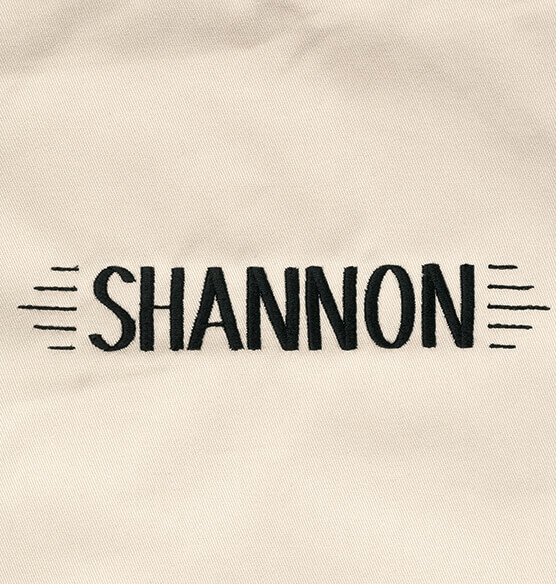 A good looking, quality personalized chef's apron. This custom chef apron has very long ties, to comfortably fit most. 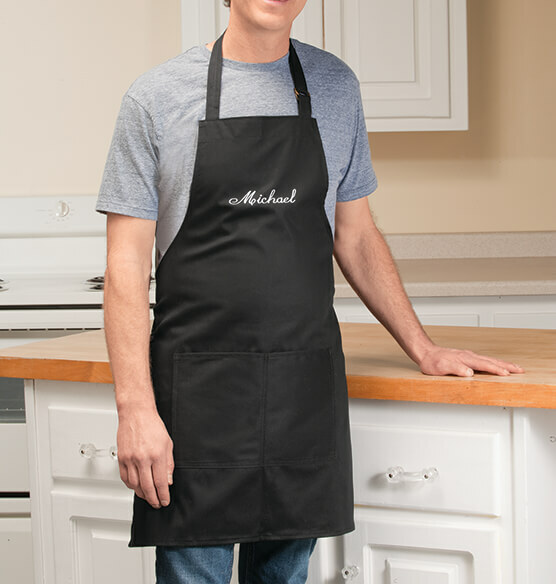 Impress with a thoughtful gift for everyone on your shopping list or treat yourself with an embroidered apron sure to make every professional chef or home cook smile. Plus, the durable fabric stands up to spills and splatters. 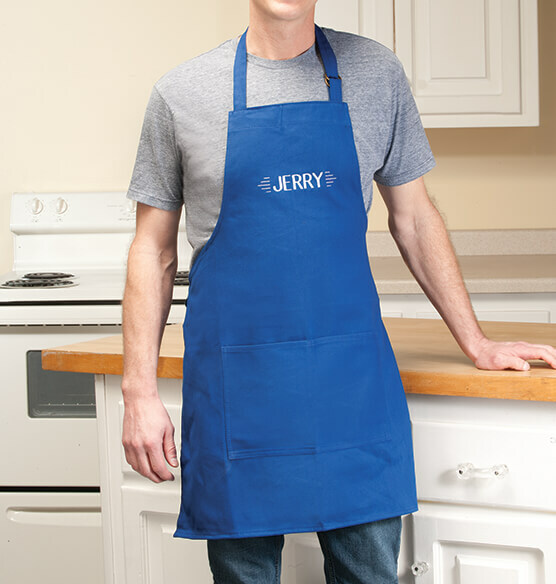 100% cotton twill, two front pockets, machine wash. Personalized kitchen apron is 29" long x 28" wide with adjustable neck strap. Specify name; limit 1 line, 12 letters and spaces. Beautiful , absolutely love them. I would buy it again if I could get it in pink! I bought this as a gift for someone who loves to cook and is a really good cook. She's always hosting dinner parties, entertaining -- she'll love wearing this for one of her many "foodie" occasions. A gift for my sister and friend. They volunteer to prepare meals for activities at our church and for family gatherings. They liked having their personalized chef aprons. I have been a Miles Kimball customer since 1955! And always pleased with your products. Receive many compliments over the years and don't hesitate to say "I bought this from my Miles Kimball catalogue." A perfect gift for which I perched! Great gift for the Cook in your family. Great quality material, Monogram looks awesome. This product is well worth the money. Apron is well made, personalization perfect! multie purposes working in side and outside. The whole family has aprons with their names on them. Now I'm getting them for their spouses. I have bought four of these aprons! 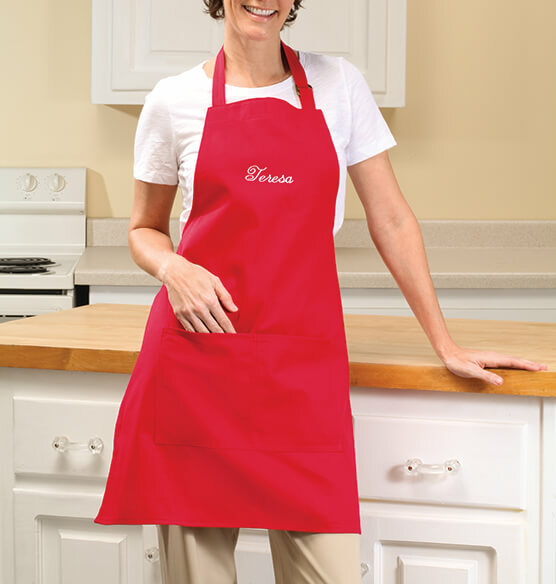 The apron is made well, stylized nicely, and one size fits all. These are good quality aprons I purchased for friends for Christmas. Now I just need one myself. have had a hard time finding a green apron and you had one. love it. There is no telling have many of these aprons I have purchased. IO buy them for the ladies of our church who work in the kitchen. They love them. I have written several reviews for you on these aprons. I keep coming back - the price is good and the quality is execellent. I have purchased about 6 of these aprons as gifts and they are great. I love that you put the name on them for us. I wish they came in more colors. The people to whom I have given them to also love them. They make a great gift - could not say more. This apron is very beautiful and very elegantly personalized. I feel very special when I am in the kitchen and also when entertaining friends. Every kitchen should have one! I have purchased a number of these aprons. I bought them for the ladies who work in our church kitchen. You can not beat the price and the style. I do wish they came in other colors..but I have mentioned this before in my reviews. This item was a birthday gift to a Senior Citizen who volunteers to serve meals every Monday and Friday at our local Senior Center. He put it on and wore it right away. More colorful than just a white apron. He was pleasantly surprised by the apron gift. I bought this for my husband for Christmas. He enjoys cooking and will use it often. I bought this as a thank you gift for a friend that had helped me in cooking something special and in supplying me with some recipes. With the personalization, it really was the perfect gift I was looking for to give her. I purchased one for my sister who liked it so much she wanted one for her husband. Now they "match". My dad is now asking for one for Christmas. Looks nice, giving as gift to my brother the cook!! My brother will use this to help keep his clothes clean. Nice apron, but the treads are hanging from where it was sewed. Will work for kitchen!!!!! I bought this as another gift for our gourmet cook. I'm sure he'll appreciate the protection it will give his clothes . This is a great apron for all outside cooking. I like the colors offered, embroidered name, but the style made just isn't what I had hoped for. apron came in different quality material. I ordered 2 Chef aprons because I have purchased one prior to these and it lasted a long time. My sister also gave me me and I had sent one to my daughter. Since my were starting to wear I decided to order two more. I received them in different packages. The blue one was similar to the one I have but the fabric of the red one in very flimsy. It is not at all the same quality as the blue one and I wonder why since they cost the same. Can you tell me why they two aprons are not made of the same fabric? After laundering, the fabric will not iron smoothly. Should be wash and wear. I refuse to give it to Joe. I expected it to go below the knees. That does not fit a guy 6ft tall. Or even at the knees. I am truly disappointed. That maybe my last order. Poor quality, thin material. I bought this as a gift for a friend who loves to cook. Given the price, I expected a sturdy, attractive apron. The only part of it that did not disappoint me was the personalization. Her name embroidered on the apron was nicely done, an attractive touch to an otherwise disappointing purchase. Although I did give it to my friend, I was embarrassed by its quality. Not good! It deserves no rating.